I went to the library the other day to check out Laura Lippman, I had read some reviews on One Person's Journey, and was intrigued. Before leaving the library I just had to make a quick stop at the new release section. I had heard about Still Missing, and added it to my pile. I knew it was a 7 day loan, and thinking why am I doing this I can't possibly read this in 7 days (I mean I was and still am in the middle of a couple other books - yes that is correct, a couple other books). I started it Monday night and just finished this morning. It was a wet dreary morning, the perfect time to sit and read. Plus I just couldn't put this baby down. This novel grabbed me from the get go, it flowed, it was an attention grabber right away, I loved the characters. I loved the chapters, each of which were her therapy sessions. It was a believable story. The ending was amazing and I enjoyed it right to the last page. Chevy Steven has her second novel coming out next year entitled Never Knowing, which I will be on the lookout for. This is book 2 from The Missing Series. While I enjoyed the first book, Found, I really enjoyed this one more. Maybe it is my love of English history or the mystery surrounding the princes in the Tower that grabbed my attention. There are so few clues as to what really happened to these 2 boys and I think Haddix did a wonderful job of creating this story. There is a third book in the series Sabotaged, which has been released in hardcover already. Models don't eat chocolate cookies by Erin Dionne is a debut novel that touches on friendships, family dynamics, and personal growth, it is a light, well-paced novel. Thirteen-year-old Celeste Harris is no string bean, but comfy sweatpants and a daily chocolate cookie suit her just fine. Her under-the-radar lifestyle could have continued too, if her aunt hadn’t entered her in the HuskyPeach Modeling Challenge. To get out of it, she’s forced to launch Operation Skinny Celeste—because, after all, a thin girl can’t be a fat model! What Celeste never imagined was that losing weight would help her gain a backbone . . . or that all she needed to shine was a spotlight. A hilarious debut featuring friendship, family, mean girls and even celebrity crushes, Celeste’s story is a delicious treat that doesn’t add a pound. How does one do a good book review within any spoilers? Some books you can do that no problem, this one though is a little harder. I so enjoyed this book, it is such a sensitive subject. It was written with a little humor, soul searching and much more. 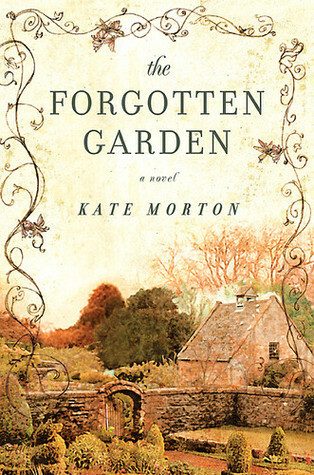 The Forgotten Garden will take hold of your imagination and never let go. 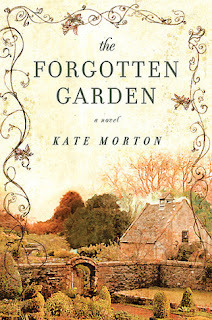 The Forgotten Garden by Kate Morton is a new favorite book of mine. I have wanted to read this book as soon as it was released. But being cheap I waited till the trade paperback version came out. Kate Morton's second novel is a rich and satisfying mystery set in England and Australia of a woman's search for her identity. A cottage on the Cornish coast is home to secrets that pull together three generations of women, despite the decades and oceans that separate them. The story of begins in 1913 with a 3 year old on a journey from England to Australia. However no adult is traveling with her. The story jumps from 1913 to 2005, back to 1975 and even back to the late 1800's. With all that jumping back and forth the story is told without confusion. It just flows from one chapter and different time period smoothly. I finished this book in a mere 5 days and was so sad to see it end. I got to know Neil, Cassandra and Eliza so well. I felt for Nell upon her 21st birthday when she receives shocking news that turns her world upside down. The story line with Eliza and her cousin, aunt and uncle was kinda creepy and made me sat the way she was treated. I loved the fairy tales added to this book, something original that added so much. I highly recommend this book and will be reading more by this talented author. Class Pet - Battle in a Bottle by Frank Asch is geared for the young reader. I picked this up at a library sale, I honestly don't think anyone has read it. It is in brand new condition. So for 75 cents I took it home. I loved the cover, which is main reason why I bought it, poor little mouse stuck in a bottle with big, ugly cat watching and ready for dinner. It''s late at night and Big Gray, the monster cat, is on the prowl. Brother and sister mice, Molly and Jake, are safe inside the walls of P.S. 42, building their nests. Jake should have listened to Molly''s advice and stayed inside. But he wants nothing to do with school, class pets, or even kids. While Molly is learning the secret art of X-ray vision from Gino, Jake is getting into trouble on the playground in another tangle with Big Gray. The only place he can find to hide is inside a ketchup bottle...and that''s when the battle begins! It only took an hour or so to read. It didn't flow like I would have liked, I found it a but choppy in places. From the beginning Jake has an attitude that he doesn't hide, he doesn't like anyone telling him what to do and makes that very clear. He is not a team player and wants to do what everyone else is NOT doing and that he how he landed himself in trouble (inside a ketchup bottle). All in all not a bad book, I think it will appeal to kids with class pets. Though looking online appears to be a hard to find book, only available used. This is the first murder/mystery that I have read in a while. 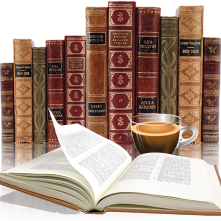 I read another book blog that gave it rave reviews (sorry I can't remember which one it was). A twelve-year-old girl and her younger brother go on the run in the woods of North Idaho, pursued by four men they have just watched commit murder---four men who know exactly who William and Annie are, and who know exactly where their desperate mother is waiting for news of her children''s fate. I did put it down a couple times till the story started to develop more, once it got going I enjoyed it. There was the mystery and suspense in there. The girl, Annie, I felt was well developed, it was like I knew her and felt for her. Some parts of the story were predictable, but the ending was different then I expected. This was an interesting novel, it got rave reviews so I was excited to read it. But I gotta say I really had a hard time getting into this book. I just found the relationship between Alice and Mr. Dodgson rather disturbing. At first I thought it was just me, but I searched a little harder and did find some reviews that had the same feeling as myself. After Alice got older and didn't associate with Mr Dodgson anymore I liked the book much better. An interesting life for Alice and I do have to admit that I never knew Alice was based on a real person. I have never read Alice in Wonderland before, but now it is part of my March to read pile. 't be picking up any of his books in the near future, the ending was somewhat depressing and sad. I don't really want to say too much more, not that anyone is reading this blog. The Constant Princess of Phillippa Gregory is the first in the Tudor Series, though wasn't written in order. I have read The Other Boleyn Girl before and was looking forward to reading this series in order. I enjoyed this book, it did grab me right away even though at times is was lacking something (though I can't say what). I felt for Princess Catalina to not have control of what would happens with her life and to be in a country so far from family. She was very determined that she would one day be the Queen, even after the death of Prince Arthur, but the near constant mention of this was a bit much after awhile. But all in all, I liked it, will continue with the Tudor series, Gregory has a gift for story telling, her books are easy to read and full of history, which I like. How much to believe as actual history, I guess is up to the reader. One of Time Lifes 100 Novels. I was told by my family not to read it. Since we are a canoe tripping family and I actually went on a trip last year and hope to go again this week, they didn't want to freak me out. So was I freaked out? No I wasn't. I found the book a little slow going at the beginning, but it quickly picked up speed. I finished in a couple of days. I found it suspenceful enough, but slow in a few places. The ending was interesting, though I thought there might be a twist of some sorts, but there wasn't. Only a couple characters were well developed, the other 2 I didn't know much about, even the bad, it would have been nice to know a little about them, who they were and why they did what they did. This was the 2005 Newbery Winner. Kira-Kira by Cynthia Kadohata, I started this book with no idea what it was about. It was an honest story, told my Katie a 10 year old girl. It follows life with her sister Lynn, her parents and little brother. Life is not easy, there was laughter and tears in this heartbreaking story. I enjoyed and will be sure to look for more from this author.